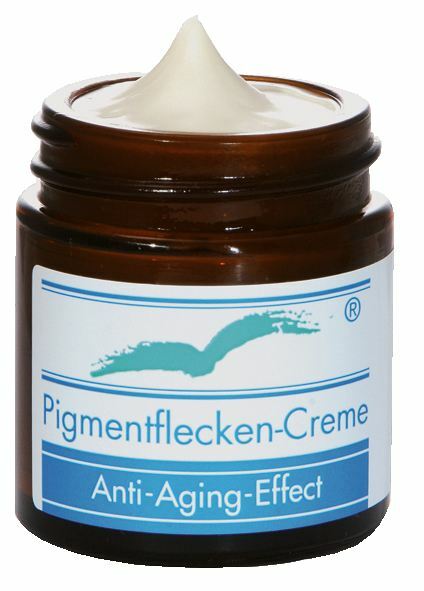 Cream against age spots and pigmentation. Cream against Skin Pigmentation recognizably reduces unsightly age spots, as well as pigmentation and acts in a preventative way. Produced with highly effective extract of the emblica bush, which is known from Ayurveda. Apart from its very good tolerance, the active skin cell protection and the significant increase of skin moisture and smoothness are scientifically proven. The ideal face care for the retardation of the aging process for a markedly attractive complexion. Also appropriate in the case of pigmentation on hands and other body parts. 2 x daily a thin layer, avoid sun bathing. aqua, ethylhexyl methoxycinnamate, caprylic/capric triglyceride, cetyl stearyl alcohol, methyl glucose sesquistearate, glycerol, phyllanthus emblica fruit extract, cocos nucifera oil, glyceryl stearate, sodium benzoate, potassium sorbate, cera alba, perfume, simmondsia chinensis oil, tocopheryl acetate, citric acid, potassium hydroxyde, hexylcinnamal, citronellol, geraniol, butylphenyl methylpropional, limonene, benzyl alcohol, citral, eugenol, hydroxycitronellal.